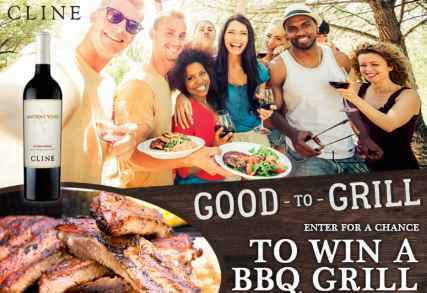 Cline Family Cellars brings you the Cline Cellars Good to Grill Sweepstakes where they will be awarding a premium gas grill valued at $1,000 to one lucky winner. Prizes You Could Win: A total of seven (7) prizes will be offered which are following One (1) Grand Prize and six (6) First Prizes. One (1) Grand Prize Winner will receive one (1) premium gas grill. Approximate Retail Value (“ARV”) of Grand Prize is $1,000,Six (6) First Prize Winners will each receive one (1) gas grill. ARV of First Prize is $250. When To Enter: The Cline Cellars Good to Grill Sweepstakes begins at 12:00:00 AM Eastern Time (“ET”) on April 1, 2018 and ends 11:59:59 PM ET on September 30, 2018. Sponsor: Cline Family Cellars, 24737 Arnold Drive, Sonoma, CA 95476, USA.